Engineered wood flooring is a vital innovation, opening up the possbilities for real wood surfaces in homes and commerical settings. How do you choose one? Let’s take a look. 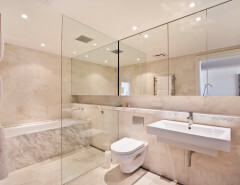 Some home improvements add functionality or visual appeal in a single room. 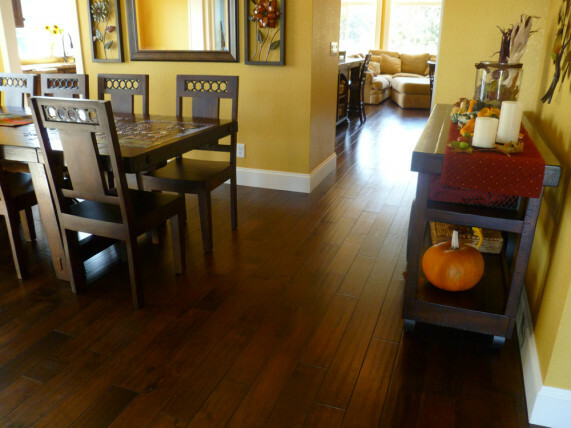 Replacing an outdated floor with engineered wood flooring, however, can transform a space. Find out what features to look for when choosing an engineered wood floor that will complement your home décor style and decorating intentions. 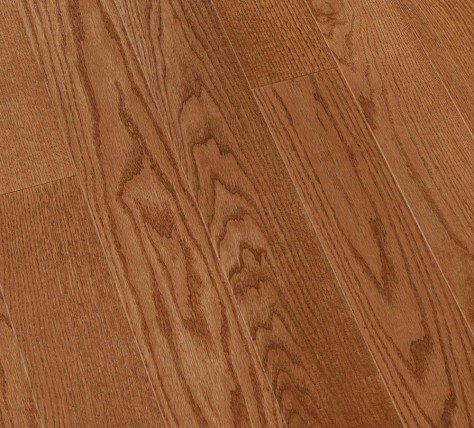 Armstrong brand Rolling Fog maple engineered wood flooring, low gloss from BuildDirect. Engineered hardwood floors offer a pretty wide selection to consumers when it comes to the top layer of real wood that help to define them. To find the right species for your home, consider both the tones of the wood with your home décor style and material durability. 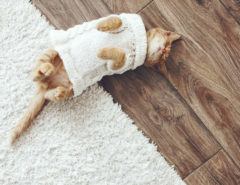 Here is a selection of species that might help to get you thinking about which engineered wood flooring types make the most sense, and appeal most to your tastes. Oak: One of the most popular species for hardwood flooring, oak has a slightly reddish tone and a medium ranking for hardness. 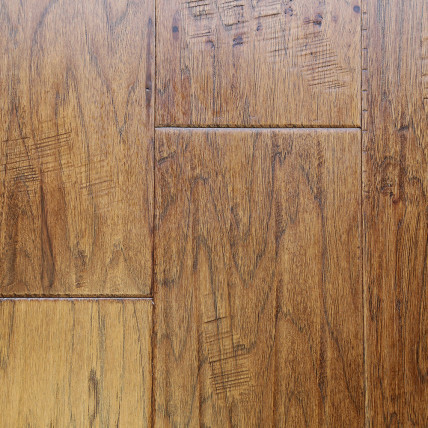 If you’re expecting average wear and tear on your flooring surfaces, oak makes a solid choice. Browse for oak engineered wood floors. Maple: This species offers an attractive natural color and plenty of durability. One of the hardest species, maple works well in mudrooms, kitchens, and other areas that experience extensive foot traffic. 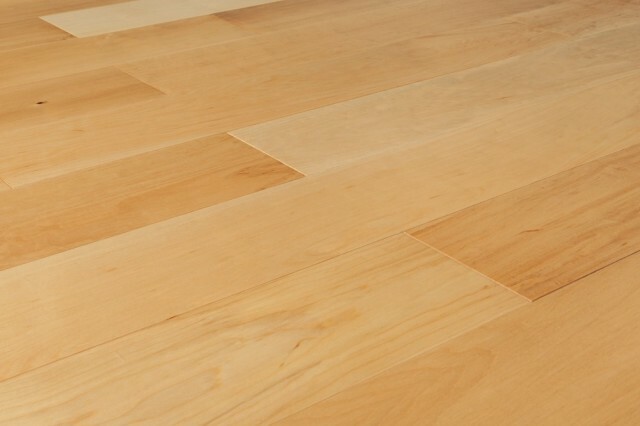 Browse for maple engineered wood floors. Hickory: A hard domestic species that also resists moisture, hickory is a smart choice in kitchens and other spaces that often experience temperature fluctuations and significant foot traffic. Browse for hickory engineered wood floors. 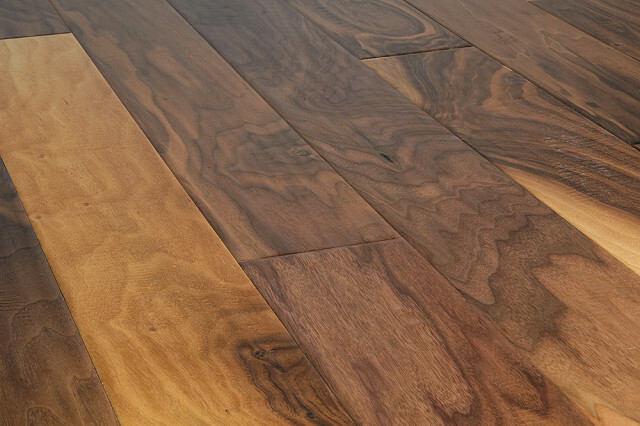 Jasper brand American walnut engineered wood flooring from BuildDirect. American walnut: On the softer side of hardwood species, yet distinctively decorative with flowing grain patterns and richly opulent color variation, American walnut flooring is a unique surface to accompany a wide variety of home decor. Browse for American walnut engineered wood floors. Engineered hardwood floors can vary in thickness. Many flooring types are made with only a few layers, while others have seven or more. Lower-quality engineered wood flooring can be as little as three-eighths of an inch deep. In general, engineered hardwood floors should have at least three layers that are cross-stacked, glued, and pressed together. Higher-quality flooring tends to have more layers, about three-quarters of an inch deep. While each layer of engineered wood flooring serves a purpose, the wear layer, or lamella, is the most important. You won’t need to worry about the wear layer much at first, but if you opt to rework the floors at any point, this layer plays a big role. If you want to refinish heavily used living room floors or refinish kitchen floors to coordinate with new cabinets, for example, you’ll want to have the thickest possible wear layer. 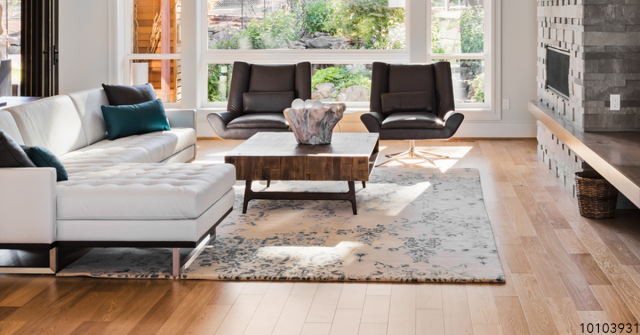 If you’re concerned about long-term durability, stability, or support in your new engineered hardwood floor, you’ll also want to choose the core layer wisely. 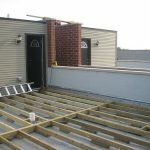 Plywood: The most common core type, plywood offers great support, offers durability, and works well for most flooring needs. 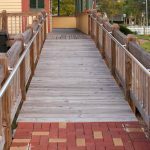 HDF: When constructed with alternating layers of plywood, an HDF core is one of the most stable and durable core options available. For many homeowners, wood stain makes or breaks a floor’s appearance. Stain is about achieving a certain color tone, and not every tone will coordinate with your new kitchen island or the family room paint color you’ve chosen. You can buy most types of engineered wood flooring prestained, but you can also stain or restain the floor after its installation. Unstained: When you simply want to highlight the natural color and grain of your hardwood flooring, leave the material unstained. Cherry: This reddish tone boosts the stately look of your flooring and works well with traditional designs. Walnut: This darker color adds a touch of class to any space and works best in rooms with a modern design. Gray: A clean, contemporary color, gray stain works well in spaces with straight lines and a modern design. 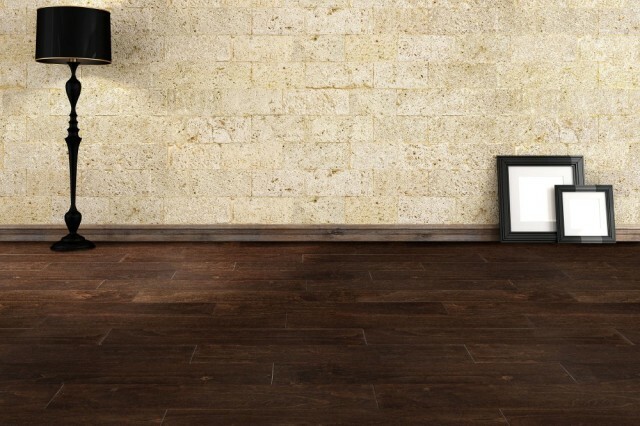 Jasper “Espresso” Engineered Hardwood Aspen Collection from BuildDirect. Browse for stained engineered wood flooring. Like traditional hardwood floors, engineered floors rely on a hardwood finish to seal the wood and to increase its lifespan. Since almost all engineered hardwood flooring comes prefinished, you’ll want to make sure the type you choose best fits your décor. If you’re already thinking ahead to your next home renovation, engineered hardwood flooring can withstand a few rounds of sanding, restaining, and refinishing. 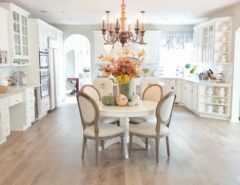 This type of flooring isn’t designed for endless renovations, however, and options with thinner wear layers might only be able to handle one round of refinishing. High Gloss: The shiniest type of finish, glossy floors give your space some serious shine. 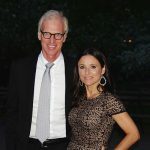 If you’re designing to impress, like to keep your interior clean, and don’t expect significant wear, a glossy floor is a smart choice in a living room, family room, or bedroom. Matte: This finish might not have the sparkle of glossy floors, but the finish surface works well for hiding scratches. If your household includes kids, dogs, or both, matte-finish floors make a great choice in any room. 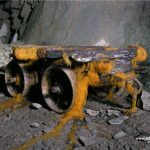 Semi-Gloss: The perfect balance between the two, semi-gloss finish has enough shine to look attractive, but not too much that the floor will require refinishing often. One chic way to show off your decorating style, a surface effect adds texture and visual interest to your engineered hardwood flooring. Take your home décor to a new dimension by adding a surface effect to the floor. Smooth: The ideal look for a professional home office or a formal dining room, smooth floors mean business. This finish doesn’t do well with major amounts of foot traffic. Hand-Scraped: Hardwood floors with a hand-scraped texture give any room a slightly lived-in look, ideal for a comfy living room or a welcoming den. Distressed: Serious distress lends a rustic look and gives floors an aged appearance. 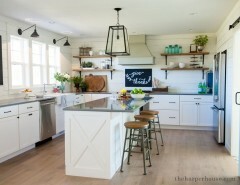 Distressed floors look great in country kitchens, lodge-style living rooms, and mudrooms. Vanier label “Maple Roasted” engineered wood flooring. Complete the look of your engineered hardwood flooring by choosing the best edge type for your space. While edge types primarily affect the feel and level of the flooring, this feature can also add to the overall look. Square Edges: Engineered hardwood flooring with square edges has a uniformly level feel and lends a clean, formal look to any room. Beveled Edges: These edge types create deep grooves between floor panels and create a more textured and visually interesting look. 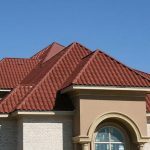 Eased Edges: These edges create only minor grooves between panels and offer a touch of visual interest while also hiding irregularities among panels. Much more than a basic home improvement, an engineered wood floor has the power to change your living space completely. 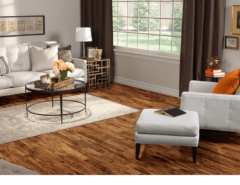 Whether you install engineered wood floors in the kitchen, living room, or in other areas of your home, you’ll make an eye-catching statement with walkable surfaces that visually unite the elements of your home décor style.